Do you have a hard time with making your classic rock guitar licks sound AWESOME every time you play a guitar solo? Do you wonder why your guitar playing never sounds quite like the playing of your favorite classic rock guitarists? The solution to all of the guitar playing problems above is "guitar phrasing". The single most important secret to becoming a great classic rock guitarist is in being able to express maximum emotion out of only a few notes. Although most guitar players know this fact to be true, many struggle greatly with developing this musical skill. Understand the most important elements that go into highly expressive classic rock guitar phrasing. Learn how to transform even the most plain sounding notes into truly AWESOME classic rock guitar licks. Discover how to make DOZENS of highly expressive variations out of very small 3-4 note classic rock guitar phrases, so that you never run out of musical ideas. 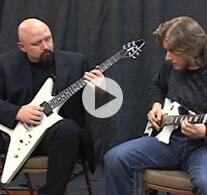 Get INSTANT FREE access to the Classic Rock Guitar Playing Video Lesson now. Simply enter your name and email, then click the "Show Me The Video" button to enter. All information is kept 100% private and confidential.